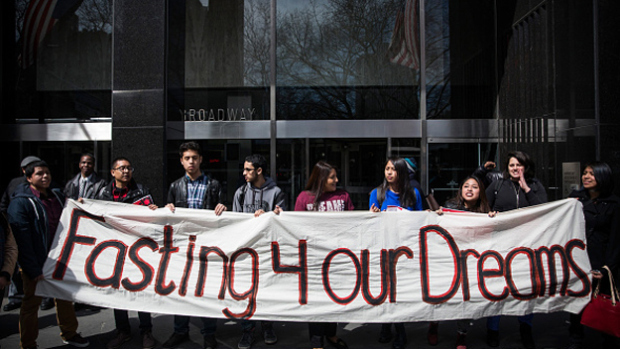 At least 40 young Mexicans went on hunger strike in New York, demanding the Governor Andrew Cuomo to include in his budget proposal a law that would benefit undocumented students. Mexicans are part of a group of at least 70 people who decided to join the protest, after Governor Cuomo announced last Tuesday that the "Dream" budget law has been removed from the draft. This proposal, which was already approved by the House of Representatives of the State, would allow illegal students, who were brought into the country in their childhood, to access the financial assistance to complete their university studies. Manuel Castro, spokesman for the Coalition for Immigrant of New York (CINY), said that "at least half" of the 70 young people who went on hunger strike are Mexicans, including himself. Participants are in the five boroughs of New York as well as in several communities: Long Island, Rochester, Buffalo and Hudson Valley.